Have you been following along the awesome Knock It Off series hosted by Heidi of Elegance & Elephants? She’s got a whole month’s worth of guests sharing tutorials for great knock off projects inspired by store bought clothes and accessories. Who doesn’t love a good knock off? As people who sew clothes, we are constantly looking at items online, in the store and on people on the street thinking, “I bet I could make that” and figuring out exactly how to recreate the look for less money. 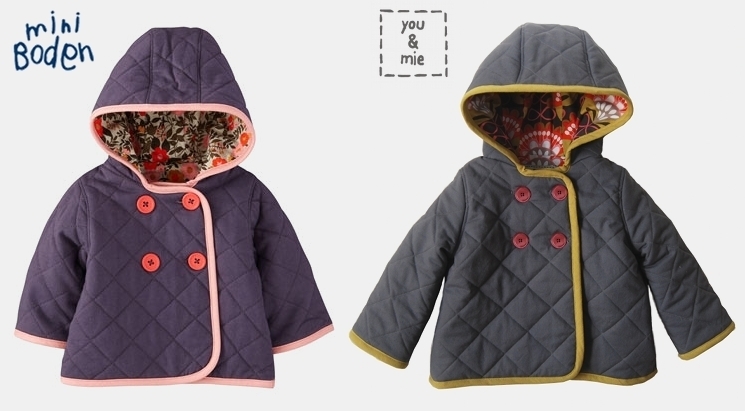 Well today I’m over at Elegance & Elephants sharing a tutorial for a quilted jacket inspired by this Mini Boden jacket. And I’m reeeeally excited about this project! I love it because it’s practical but super cute and once you learn how to construct the jacket, you can change it up and infuse your own style (something that store bought items often lack). The pattern itself is unisex and it’s reversible!! Whaaat!? I know, it’s crazy. So pop on over to Elegance & Elephants to see the full tutorial. While you’re over there check out the rest of the knock off projects – they are fantastic! And if you use this tutorial (or any you & mie tutorial), remember to add your photos to the flickr group because I really love seeing your creations! Oh and quick shout out and thank you to Kristin who helped me pick this project out of the millions of knock off ideas I had floating in my mind. She rocks. 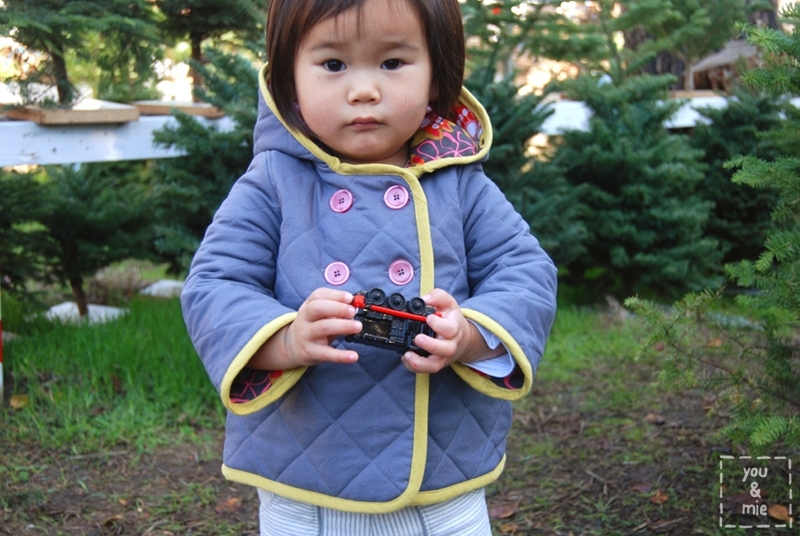 This entry was posted in guest post and tagged knock off, quilted jacket by Cherie. Bookmark the permalink. OHHHHHHHH!!! seriously cherie, this is the best thing i’ve seen in a loooooooong time. you are so stinkin’ good!!! eeek! I”m so glad that you are doing this! I’ve had the exact same jacket pinned to knock off. You. Are. Amazing! OH MY GOSH another amazing creation! LOVE!! I totally need to make a three piece hood. Love your fabric choices and the tutorial. I made Ansley a quilted coat last year but used prequilted fabric and it was a big snug too b/c the fabric had zero stretch. Yes, I think that’s the exact same problem I have – it has no stretch and is too snug. Definitely shoulda gone up a size. Or maybe used knit? Or both. This is beautiful. You did a really nice job with the details on the tutorial too. So awesome! And so well done! Wow…. Amazing. It looks SO professional, just as good as the original! THANKS EVERYONE! I was really excited about this project so it’s really amazing to have such a warm response. Thank you!! CHERIE. THIS IS AWESOME. YOU EXECUTED IT PERFECTLY. YOU ARE AMAZING. THAT IS ALL. Thank you!! I did make my own bias tape, because I was determined to match that chartreuse color in the lining. I would have used pre-made bias tape if the color had been available, but the selection is so limited. Thank you, Ayako! I’d love to see your version if you do make one for your son! Your jacket is all over Pinterest Cherie! I love it! You are AMAZING and oh so inspiring! I have to try this. I am a newbie to sewing but I will try anything once!